Hello Friends, the music charts are done! Yip factor is up and now it’s about making musical sense of the layers of scribble that each muso faces. This is the enjoyable part of the whole dance. We’re rehearsing today and we get to hear the story that the notes have been holding secret. This week is an exciting one with two very diverse concerts in the works. First off on Friday we’re coming together with the Peter Sprague String Consort for a show at the amazing Proscenium Theatre at the Canyon Crest Academy in Carmel Valley. I went to a performance at this hall a few months back and it’s a wonderful sounding and gorgeous looking spot. We’re stoked to be playing there! The Canyon Crest kids will start the program off with 20 minutes of their best and then our group takes the stage for a program of cool jazz, samba, and classical fusion musicall original compositions save for a few Chick Corea pieces and one old gem by Bach. The group is 2 violins, cello, viola, bass, drums and me on the guitar. If you want a little more background on the group including audio samples click here. Look below for more details for this Friday’s concert. Hope to see you there! 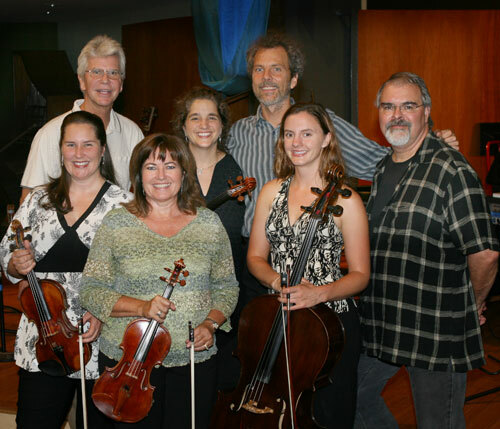 The Consort with (left to right) Bridget Dolkas, Bob Magnusson, Jeanne Skrocki, Pam Jacobson, Peter, Carter Dewberry, and Duncan Moore. Also this week on we’re playing a show that includes jazz vocalist Kevyn Lettau along with our group. Do any of you remember back to the late ‘70’s and the band we had called Dance of the Universe? I get asked all the time how Kevyn is doing and where is she now and this leads me to believe that a bunch of you heard and dug our group back in the day. Now’s your chance to hang out with us all again. Kevyn is keeping it real up in L.A. and it’s a treat to have her down to on this rare visit to SD. She’s one of my favorite vocalists ever and when you check her out singing samba and scatting a chorus on Honeysuckle Rose you’ll get where I’m coming from. We’re playing at the Point Loma Nazarene University in the beautiful Crill Performance Hall overlooking the majestic blue on Saturday evening. Look below for more details. 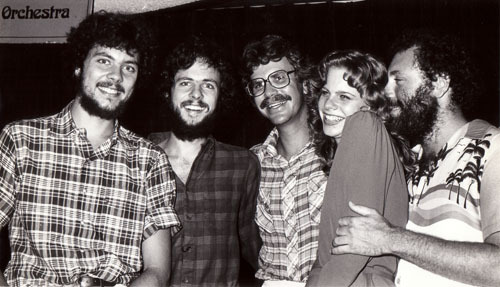 The early band with (left to right) Peter, Tripp, Bob Magnusson, Kevyn Lettau and the forever non-conforming Billy Mintz. And finally this week I’m looking forward to dissolving into my solo guitar repertoire at the world famous Roxy Restaurant in Encinitaswhere jazz, falafel burgers, ice cream and North County’s finest folks bring it on home.